Coins are an ideal way of expressing ideas or to mark historical events. The United States Congress has been authorizing commemorative coins since the first commemorative half dollar was created in 1892 honoring the 400th anniversary of the discovery of the New World by Columbus. Most commemorative coins are issued at a premium above their face value. The additional funds were used for particular projects or charitable organizations. 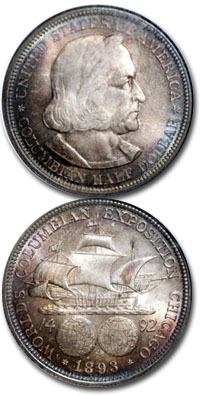 The Columbian half dollars, for example, were sold at $1 each at the Columbian Exposition in 1893 and the 1936 Cincinnati Music Center commemorative half dollars made in Philadelphia, Denver and San Francisco were sold in sets at the price of $7.75. Though the half dollar has been the main vehicle for silver commemorative coins, there have been two quarters, one in 1893 featuring Queen Isabella made for the Board of Lady Managers for the Columbian Exposition and the Bicentennial quarter with the dual dates 1776-1976. 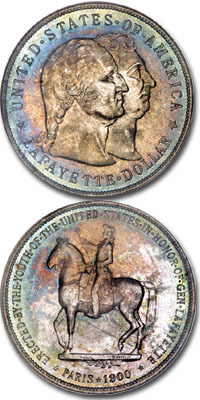 There are also dollar commemoratives, the first being the Lafayette dollar of 1900 and the next issue made 83 years later commemorating the 1984 Olympics. The number of commemorative issues peaked in the 1930’s, and declined in the 1940’s to only one design featuring Booker T. Washington, and one other in the 1950’s featuring George Washington Carver. Recently, commemorative issues have become popular again and the United States Congress has authorized commemoratives almost every year since 1982. Collectors love commemoratives and there’s an active market for the all the issues including the modern ones. Putting sets together of the pre-1982 coins is a daunting challenge in that there are 144 pieces in the silver commemorative series alone with 50 different design types. If you have some commemorative silver half dollars, they may be worth from a few dollars to hundreds of dollars, depending on the rarity and demand for that type.